One of our most pleasant week-ends away, in the last couple of months, was a trip to Enniskillen, in Northern Ireland. 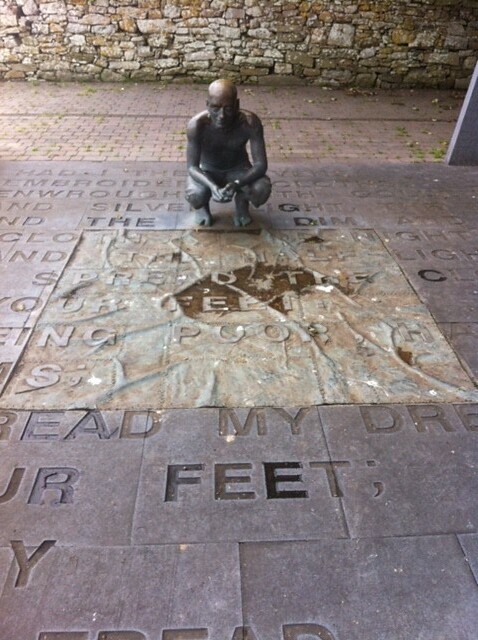 We went there with the children and the Italian grandparents: we left Dublin on a Friday afternoon, excited for this impromptu cross-border road trip, and armed with maps and nibbles, we drove north. Enniskillen is the largest town in county Fermanagh, Northern Ireland, and sits in a beautiful spot: built on a natural island which separates the Upper and Lower sections of Lough Erne, it is surrounded by water, accessible throughout the town through gently sloping lawns. 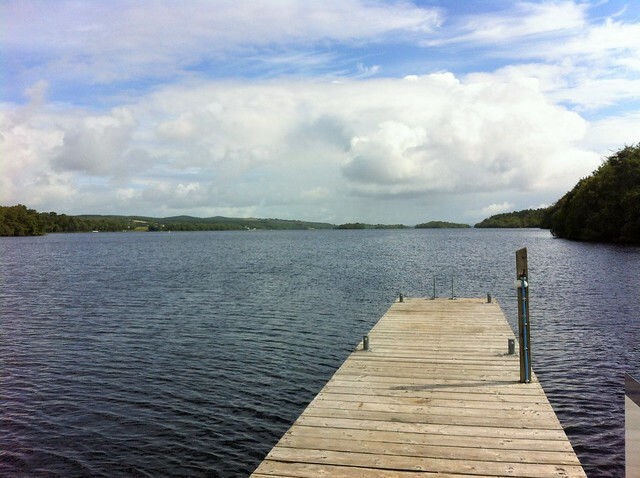 The first part of the lake that we saw and maybe the most impressive is the one overlooked by Enniskillen castle: dating back to the 15th century, it once was the home of the Gaelic Maguire chieftains, an important part of Co Fermanagh’s heritage and now hosts a visitors centre and museum. We got to Enniskillen in the late afternoon, at a time when the visitors centre had already closed for the day, but we were anyway able to take a walk around the castle and get a first idea of that part of town: in the evening light, the clear sky reflected in the still waters of the lake, Enniskillen seemed a pleasant town and the smiles of the people walking the dogs along the lake made for a friendly welcome. Following the children’s request for an early dinner, we soon left the lake shores and made a move towards Enniskillen’s main street. The town had a few nice cafes and pubs to choose from, some even offering live jazz sessions that intrigued my jazz loving husband, but at first glance didn’t seem to offer much to a family with children: many places seemed only open for lunch and the streets were so quiet we wondered if we had made a mistake coming here for the night. Maybe people work in Enniskillen but live in the country? It seemed like a reasonable guess, but we soon realised Enniskillen was all but quiet: we were just looking in the wrong places! Following a gorgeous smell of pizza, we soon entered a restaurant on the main streets and found it teeming with life: Little Wing Pizzeria seemed to contain all the Enniskillen inhabitants we hadn’t met on the streets! The pizzeria was bursting at the seams with people of all ages and beautiful plates of pizza and garlic bread were paraded around by efficient waitresses. The place seemed very family friendly, with kids menus and high chairs, but unfortunately too full for us to be able to partake of their beautiful food. Faced with a wait over one hour, we decided to leave but soon stumbled in what turned out to be a great find: Franco’s. Located just a few minutes away from the side street, this restaurant has a lovely, warm atmosphere: a decor in between the traditional pub and a white tablecloth restaurant, we got there when they had just one table available, that we soon secured. It turned out to be a fantastic place for us: the menu is mostly Italian, but as well as pizza and pasta they offer lovely seafood and meat dishes. I got a really tasty plate of mussels, my dad grilled goat cheese salad and duck and the kids the pizza they had dreamed of since earlier in the day: three happy generations at the table! 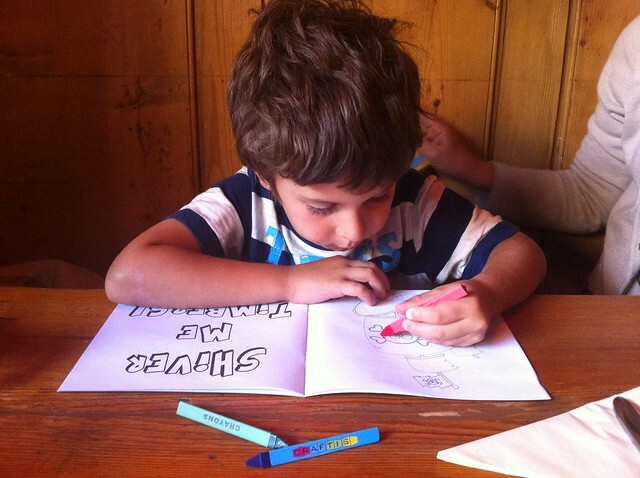 A lovely touch was the kids menu and the fact that they greeted the kids with a goodie bag with colouring pencils and toys: pirates for my boy and princess for my girl – a lovely touch and a great way to keep them entertained! After dinner we went back to the Enniskillen main street, to find again our first impression of a sleepy town to be entirely wrong. On that evening Enniskillen was hosting a vintage cars parade: the whole town was there cheering, all generations together. We had a lot of fun and the kids were drunk with excitement, between the unusual cars and the balloon maker! 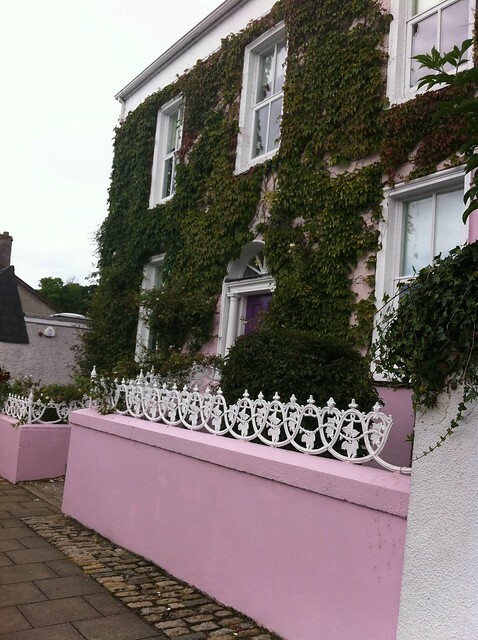 We had booked accommodation outside Enniskillen town and after the parade we made a move to reach the lovely B&B we would have called home for the night. The place we had chosen was called Toddsleap cottage and was a lovely country home with two rooms, perfect for a family like ours, travelling with two children and grandparents. The rooms were spacious and comfortable and the owner gave us a really warm welcome: in the morning, we had a lovely homemade breakfast and they took out bikes for the kids who darted into the garden to play despite the rain! Toddlsleap cottage, we discovered in the morning light, is just in front of an adventure centre of the same name: our kids were too young for that kind of adventure and the grandparents were not likely to enjoy a day in the mud, so we made alternative plans but took a note of the place for future family trips. a sign promising an ancient monument with a name I won’t try and pronounce! After a long morning of lakes and woodlands, we headed to Belleek, a small town just north of the border with the republic. 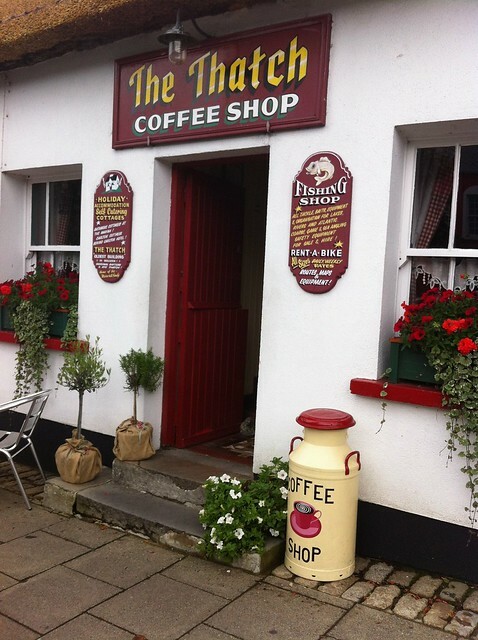 Belleek is famous for its pottery and is a lovely little village with colourful houses and lively coffee shops. We had a quick walking photo tour and then we had lunch one of the local joints. The one in the photo below is a gorgeous old, traditional cottage now hosting a coffee shop (you’ll smell the cakes as soon as you step in! ), but we had lunch in ‘The lemon tree’ in front, a small lunch place with Spanish inspired tapas and super friendly staff – it even had a corner with kid’s toys! The whole week end was a huge success: just a few hours away from home, we really felt like we were on holidays and we saw beautiful landscape. How to get there: car. It is possible to reach and explore Northern Ireland with the local buses, but we found that the car was ideal to reach more isolated parts of the lakes. 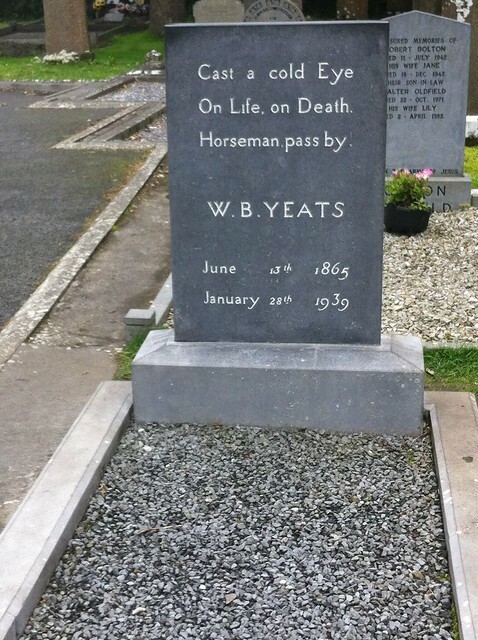 Have you ever been to this part of Northern Ireland? I’d love to hear your stories! Please note: this post contains affiliate links, which means that if you book accommodation through on of them, I will receive a small commission, at no extra cost to you: this will help me cover the expenses for running this blog and, if I’m lucky, the cost of the cup of coffee I love to sip from when writing! Thank you!